The Renaissance Köln Hotel, Magnusstrasse 20, would be our home for three nights. The large, inviting lobby was quite comfortable and the front desk staff was accommodating and anxious to please. Our nice room faced the quiet, inner courtyard. The highlight was the firm mattresses on the twin beds and the comfy pillows. There's an indoor pool, whirlpool and sauna and all the other conventional amenities for the business traveler. The buffet breakfast was superior and served in a smart dining room. We had the pleasure of visiting the Jewish Parents Home. The average age of the 31 Jewish residents is 85, each living in a small apartment; there's a waiting list of 25. A larger facility is in the planning stages to house 75; as in all countries, the senior population is growing. We toured the quite nice facilities with a lovely garden before they served us a delightful lunch of open-faced sandwiches and fresh fruit. The Rabbi guided us through Mülheim to the site of his home, his parents' place of business and the old synagogue. The town sits on the Rhine and has become a bit shabby. The Rabbi told us it had been a prosperous and pretty place before the war, but it has yet to regain its former stature. The center of contemporary Cologne Jewry is the great Roonstrasse Synagogue, where we joined the congregation for Friday night services. The simple, stark Holocaust memorial room was quite striking, as was the reconstructed interior with its huge blue dome. After the service we adjourned to the synagogue's kosher restaurant for a dinner of gefilte fish, chicken soup and roast duck served with lots of beautifully cooked vegetables - all nicely prepared and very tasty. Especially nice was sharing our table with prominent members of the congregation and their families. It was close to midnight when we walked back along the ring road; it was lined with cafes and eating places filled inside and out with folks enjoying themselves but smoking too much. While sitting at a sidewalk cafe in Haifa, Israel last fall, we were fortunate to meet Gabi and Bernd, a German couple from Gummersbach, which is about 50 KM east of Cologne. We stayed in touch by E-mail and made a date to spend our free day, Saturday, with them. And what a treat it was! 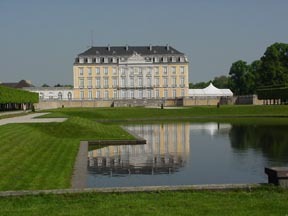 They picked us up at our hotel and we were off to Brühl, just south of Cologne, to visit Schloss Augustusburg. Unfortunately the palace was closed to visitors as they were preparing for a special exhibition. I am looking at a brochure, which features the famous palace staircase designed by the architect Balthasar Neumann, which leads straight up to the celestial ceiling painted, by the Italian fresco artist Carlo Carlone and it is exquisite. Yes, we really missed something very special. 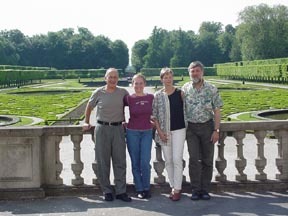 However the walk through the vast gardens to the nearby Schloss Falkenlust helped to compensate. 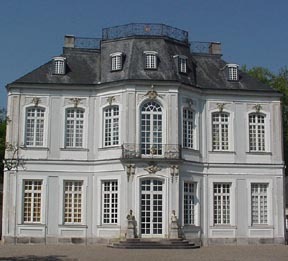 Falkenlust Hunting Lodge, the private refuge of Clemens August, who built the palace, is where he kept his much-admired falcons. It was a delightful tour on a beautiful day. Gabi and Bernd invited us to their lovely home for a delightful lunch. We sat outside, surrounded by green hills and woods enjoying a delicious salad, which Gabi prepared, of mixed greens, tomatoes, zucchini and hard-cooked eggs, dressed with a bit of heaven. Linda got the secret recipe and will surprise me one of these days. Freudenberg, which means mountain of joy, is a sweet village southeast of Gummersbach. The white stucco and timber-beamed homes that dominate were destroyed over the years but rebuilt so beautifully that the town is as pretty as a picture. The camera kept clicking away as Linda tried to capture the beauty of this historic village. Meanwhile, it was other mountains of joy I had on my mind once Bernd remembered that in this small German village was an excellent gelato emporium. Besides the superb gelato, the panna (whipped cream) was the real thing - definitely Freudenberg! As this was the first Saturday in May, fate brought us here in time for a very special evening called The Rhine In Flames. Some sixty boats, specially decorated and lit, would start in Linz and cruise along the Rhine to Bonn. The banks of the river would be lined with red lights with fireworks displays at various points culminating in a huge extravaganza when the procession arrived at Bonn. A friend of Gabi and Bernd joined us for dinner and offered to lead us on a traditional climb of Petersberg Mountain to a vantage point at the top. The Haus Schlesien Beer Garden in the village of Heisterbacherrott was a perfect spot to start a memorable evening. There is nothing like a good German beer under the trees. For dinner we enjoyed traditional favorites, potato pancakes and roast pork medallions on a bed of salad and mushrooms. With stomachs fully loaded, adding to the difficulty, we climbed straight up on narrow paths for an hour to the top. About halfway up it became dark and luckily we ran into a fellow with a flashlight who knew the way. There's a famous and gorgeous hotel on the plateau of the mountain. The large open area near the hotel is where the throngs gather to view The Rhine In Flames. The three girls got up on a ledge to get a better view above the crowd and at their invitation I decided to join them. In so doing, I managed to step off into space backwards into the blackness surrounding us and fell about a dozen feet to a somewhat soft landing on my head, nearly strangled by the strap of my heavy shoulder bag. Bernd grabbed a flashlight offered by an onlooker, leaped over the "protective barrier" and climbed down to drag me back up. Miraculously, I escaped with just a few scratches and bruises. When you consider the entertainment factor and all the sympathy, perhaps it was worthwhile, but Linda will never agree. When we met Bernd and Gabi in Haifa they spoke to us, as non-Jewish Germans of the post-war generation, of the shame they felt for the deeds of their people and how they represented the new Germany where such outrages could never again be contemplated. It is with visits such as this that we can show our support for their accomplishments in coming to terms with Germany's shameful past.